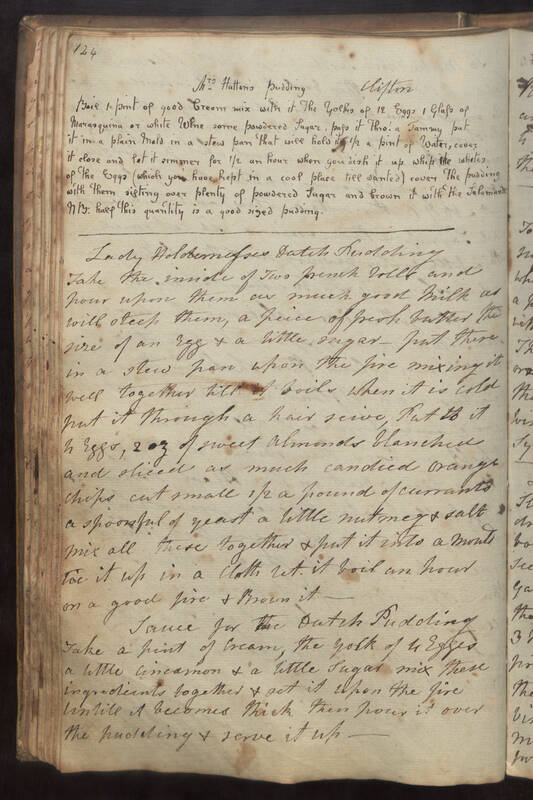 Mrs Hattons Pudding Clifton Boil 1 pint of good cream mix with it the Yolks of 12 Eggs 1 glass of Marasquina or white wine some powdered sugar, pass it thro a tammy put it in a plain mold in a stew pan that will hold it 1/2 a pint of water, cover it close and let it simmer for 1/2 an hour when you dish it up whip the whites of the Eggs (which you have kept in a cool place till wanted) cover the pudding with them sifting over plenty of powdered sugar and brown it with the salamander NB: half this quantity is a good sized pudding. Lady Holdernesses Dutch Pudding Take the inside of two french rolls and pour upon them as much good milk as will steep them, a peice of fresh butter the size of an egg & a little sugar - put there in a stew pan upon the fire mixing it well together till it boils when it is cold put it through a hair seive, put to it 4 eggs, 2 oz of sweet almonds blanched and sliced as much candied orange chips cut small 1/2 a pound of currants a spoonful of yeast a little nutmeg & salt mix all these together & put it into a mould Tie it up in a cloth let it boil an hour on a good fire & Brown it. Sauce for the Dutch Pudding Take a pint of cream, the yolk of 4 Egges a little cincamon & a little sugar mix these ingredients together & set it upon the fire untill it becomes thick then pour it over the pudding & serve it up.